It is the height of midsummer, and my steep walk down to the beach is accompanied by coastal plants in fervent bloom. The air is filled with the dry, pungent scent of white yarrow and yellow tansy, and the dusty path has a barbed fence of blackberry and purple italian thistle. My steps feel light and unencumbered, a rare experience in this sixth year of motherhood. I feel strange without a little hand to hold, yet I am also reveling in the opportunity to move with my own rhythm, to go at my own pace. As I look out across this little pocket of the Pacific, I see a sleek, dark head pop out of the water, with even darker eyes. 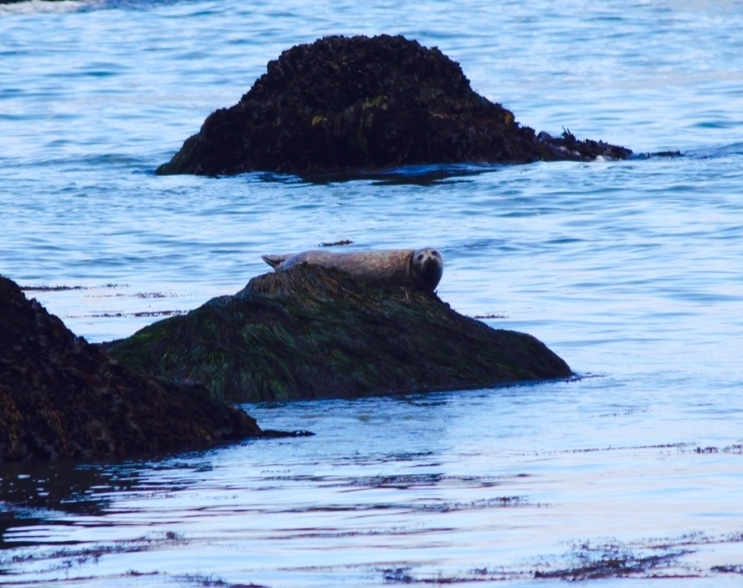 A harbor seal. My heart smiles as I think of the Selkie myth...a creature half seal, half human. She can walk on land as a woman, but only at great risk, as she must take off her seal skin. If it is stolen (and in the stories, it usually was) she will be landlocked. Sometimes she may still have a happy life as a wife and mother, but the pot hanging over her hearth will always have seaweed soup simmering, her gaze straying out to sea. I left daddy and daughter still slow and sleepy in the early dawn to go on this solo foraging adventure. 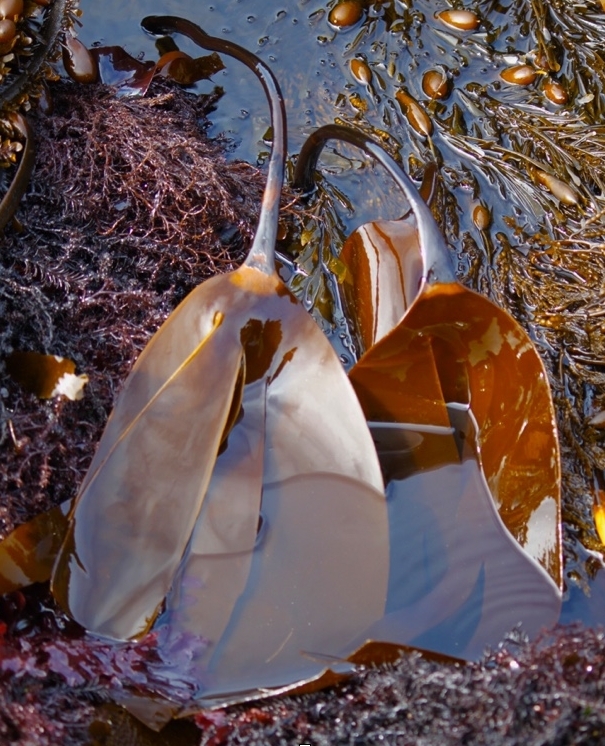 May to September is when seaweeds are abundant on the California coast, and the tides around the new and full moons of June are at their lowest. 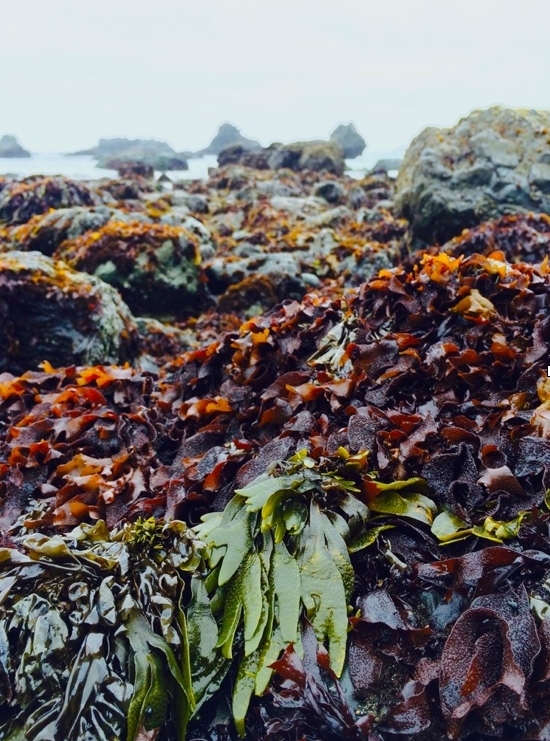 An extremely low tide is essential for gathering seaweed, since the blanket of water needs to be pulled back enough to reach some of the most choice edibles. It is towards this slippery terrain of rock, anemone and algae that I now head, moving past the frontier of the comfortable known, to tide pools containing their own secrets. The intertidal zone is a place of dynamic interaction between rock and wave, a fertile edge where change is constant, and many stressors call for literal resiliency. The plants that grow here exemplify adaptability, sometimes drying out completely for half a day, waiting for the nourishing waves to return. Rather than roots at their base, they have what is called a holdfast, and it anchors them to their place in life. The stem, or stipe, is at once rigid and totally flexible, topped with fronds that sometimes come with their own little buoys in order to stay afloat and receive light for photosynthesis. Some sea plants, like nori, don't have a stipe, instead waving their fronds directly from the holdfast and choosing to live in shallower waters. Bounty appears on the first of the rocks still damp with receding waters and I pick a piece of little rockweed for my initiatory communion. I savor the sensation of outer meeting inner as the smell and essence of the sea rolls around on my tongue. Slowing my breath I steady my mind and remember to move with reverence, grace and mindful attention. When we wildcraft, we spiral down the curls of DNA, returning from our modern definition of consumers to our ancient roots as gatherers. Seaweed gathering also has another ancient connection. We all began our lives as mer people, swimming in our own private ocean, the womb. Amniotic fluid has a near identical composition to seawater, and the plasma in our blood (the watery part) is also highly similar to the salt and ionic content of the ocean. Being a mother, I often think of how children orbit around us, pulling on our tides of blood and milk. We mamas are both earth and ocean, land and sea, anchor and wave. The intertidal zone is an apt metaphor for raising children, with its pressures and stressors, fertility and growth, demanding that we hold fast and also be able to ebb and flow with the changing tides of needs and moods...both our own and our children's. I feel my best as a mother when I am able to be present and be a presence, spaciously containing my daughter and her tidal moods, and my own expansion and contraction, without detaching and pushing away, or clinging and pulling close. I am by no means a totally zen mom, but this ability to find space in the crowded demands on attention, time, my chocolate bar, is the only ability I can be sure will provide me solace when the going gets rough. Cultivating this kind of roominess is nothing fancy, but it cannot be done without support. Seaweeds, and the emotional and physical fluidity they offer, are good allies. Seaweed is cardio-tonic, meaning it strengthens the heart. Because of the mind-body connection, when the heart is physically strengthened, our ability to handle emotions stored in the heart and chest region (anxiety, fear, sorrow and shame) is increased, our wounds washed clean. The nervous system is calmed by the minerals in seaweed (think of it as a relaxing day at the beach for your nerves), and eating small, daily amounts of seaweed support our lymphatic and immune system. Seaweed's resume also includes (and is not limited to) balancing thyroid hormones and metabolism, soothing the gut and bowels, easing PMS and menopause symptoms, and as essential support for those with fibromyalgia and chronic fatigue. Regardless of how good one's diet may be, nearly everyone is in dire need of more iodine, magnesium and trace minerals. We evolved from and with the sea and sea veggies nourish our bodies on the cellular level. Looking up from collecting ruffles of nori, again I see the mournful, receptive eyes of a seal watching me from the waves. It is as if those eyes understand the depths of the soul like they understand the depths of the sea. As an ecopsychologist, I frequently hear mothers relate a loss of sense of self in the early years of motherhood. As if their own selkie skin was stolen by the beautiful, sudden, transformative experience of becoming a parent. Raising kids is a joy and it is also very, very hard. For the wounded, depleted or chronically ill mother, practicing conscious or attachment parenting may call on every last internal reserve. For the mother who did not experience full attachment to her own caregivers, to the mother who needs more separation and time alone than she gets, for when pregnancy has mined a mother's own deep sea deposits of trace minerals...there is a need for rebuilding, reparenting, remothering ourselves. We can turn to The Great Womb, the mother of all life, for healing and to learn how to hold our own needs and pain, while at the same time cradling our children's experience with the vastness of the sea. Sometimes we move into full letting go or separation from certain habits or patterns as we crest the steep waves of learning, but we never stop holding fast. The healthy attachment our children experience with us becomes the foundation for their own ability to cling to a sense of self love amidst the changing tides. Add seaweed (and mushrooms and ginger if using) to boiling water. Simmer for 20 minutes. Leave seaweed in if you like, or strain it out if you are still getting used to sea veggies. Season with soy sauce etc. and sip quietly...even if you have to hide in the bathroom to do it. Tie up ingredients in your bag or bandana square, and place under the tap while your bath runs. Allow to steep for at least 5 minutes and leave in while you roll in the waves. You can also use the bag as a loofa, to take take full advantage of the yumminess. If you harvest seaweed yourself (see resources) you can put fresh (or dried) strands of feather boa seaweed in your tub for a true mermaid experience. Fucus or Bladderwrack: High in carrageenan, and therefore slimy. Good for thyroid support, arthritic joints and especially the skin. Hydrate a small piece and use the mucilaginous gel as a moisturizer and to heal burns (better than aloe!). Be warned...it's very fishy when first applied, but the smell fades. Contains iodine, calcium, magnesium, potassium, sodium, and trace minerals, plus more. Nori: Especially good roasted or fried, or crumbled on top of food. Also a cancer fighter. High in protein and vitamin c, as well as vitamin A, potassium and magnesium, etc. Kombu: One of the easiest ways to get seaweed nutrients is to put a small piece of kombu (2 inches or so) in your grains, beans and soups as they cook. Excellent for burns, sore throats and heartburn. Mermaid secret = after rehydrating, the mucilage makes the best natural lube! Contains fucoidan which protects against gamma radiation. Along with being high in iodine, calcium etc. like the other seaweeds, kombu is also high in glutamic acid. Aside from being a flavor enhancer, glutamic acid is an amino necessary for vegetarians and vegans. Bull or Sea Whip: Ground up and mixed with toasted sesame seeds to make gomasio, this is another easy way to get iodine and minerals in your diet. One of the highest in mineral content, bull whip kelp is 25-50% mineral when dried. Includes calcium, B vitamins, manganese, iron plus the usual like iodine, potassium, magnesium etc. Turkish Towel: A tasty and crunchy seaside nibble, turkish towel is a fun one for the bath...the pieces are rough and bumpy and make a great, nourishing loofa in the bath or shower. High in vitamin C and carrageenan = perfect for skin care and anti-aging. I have been a forager ever since childhood, and most of what I know about edible and medicinal plants comes from my interactions with them in the fields, forests and shore. However, I no longer condone wildcrafting. This is simply because there are too many people doing it. Foraging became a fad in the early aughts, and many of the spots I used to source from have been depleted or destroyed. I absolutely think that you should get to know plants in the wild, and I support having a little trailside nibble. When it comes to seaweeds, I also encourage you to get to know these plants in their habitat, but I do not encourage wildcrafting them unless you 1. Spend over a year getting to know these plants, in the same spot, without harvesting 2. Harvest from a place where no one else does, and no one else will and 3. Gather only the smallest of amounts for personal need. This article is meant as an intriguing introduction to sea veggies, but is by no means exhaustive! There is much to explore at low tide.